It’s important to give thanks. It’s equally as important to ensure your organization stays afloat. Around 25% or more of all annual giving in the U.S. occurs during the last three months of the year. An estimated 43% of higher income donors (from households earning greater than $200,000) donate more during the holidays. However, running the same old events year after year can get old, for you and for your donors. If you want to shake things up, keep calm and continue reading! Donorbox is a powerful fundraising software that is super simple to setup and attracts more recurring donors, and to help you get started, we’ve compiled creative fall nonprofit fundraising ideas that will help you take your fundraising efforts to the next level. 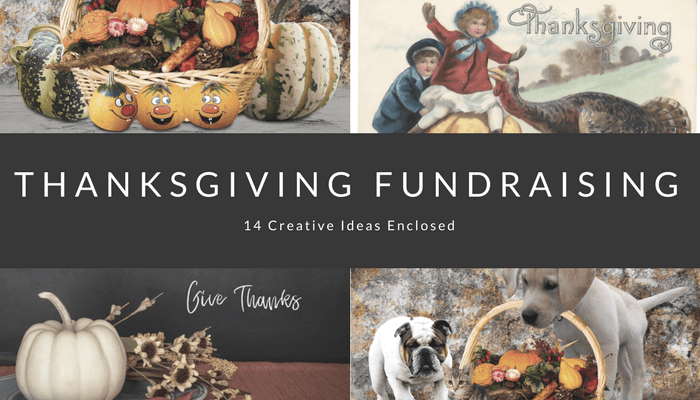 We are going to take a look at 3 major principles to have in mind when fundraising this fall, and 14 fun Thanksgiving fundraising ideas. Thanksgiving is the perfect time to connect with existing donors. Mobilize volunteers to write ‘thank you’ emails (or handwritten ‘thank you’ cards for an added touch, especially if your organization is smaller). If your organization is bigger, consider organizing a Thanksgiving dinner. Try to keep it at ‘thank you’ and not ask for more donations immediately. This not only encourages the existing donors to keep giving, but it shows you care about your supporters. 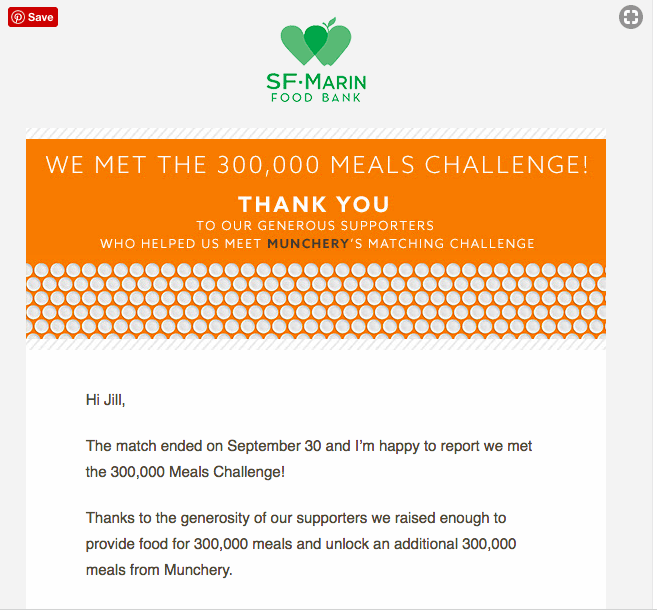 Word of mouth is still an excellent tool for fundraising! This is not to say you should thank your donors only for Thanksgiving. Appreciate your donors throughout the year, and embed the spirit of gratitude into the very fabric of your organizational culture. You could even engage your Board of Directors and have them make some calls to donors thanking them for their support. 10-20 calls per person is a reasonable amount. Send them photos from the field. Invite them for a tour of your organization. Ask major donors if they would like to get involved on a deeper level (e.g. serve on a board). Send them a “thank you” letter written by someone the donation helped. Embed an interactive infographic in your “thank you” letter. Giving is essentially an emotional decision. We donate when we feel sympathy. Showcasing individual stories of the affected individuals your organization is helping is more powerful than throwing statistics around. Individuals connect with individuals. Make sure to present a single identified story this Thanksgiving to increase giving this fall. Gratitude is a positive emotion and is one that most of us experience during Thanksgiving. Many researchers have found that gratitude positively affects generosity and willingness to help. Bartlett and DeSteno showed in their research on gratitude and prosocial behavior that people experiencing gratitude spend more time helping others. The key this Thanksgiving is to work with the sentiment of gratitude to increase giving, but without manipulation and inducing guilt. A good way to do this is to be thankful to your donors, as described in point 1, reminding them of what they helped you achieve the previous year. To amp it up and make it more personal, opt for letters showcasing impact, rather than emails or social media posts. 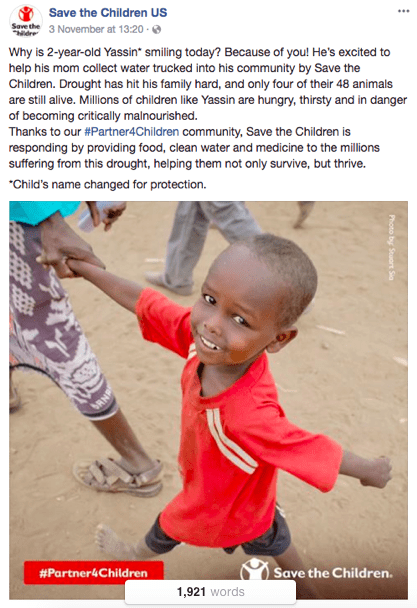 If your donors are millennials, tagging them in social media posts might still be the best way to go. Then, ask your supporters to give tastefully, with a focus on warmth, community, and cheer, not guilt because of all they have. Engage with your donors and supporters by offering a Thanksgiving-themed giveaway on social media. Partner with a local business and offer a discount coupon or a gift card with every donation. 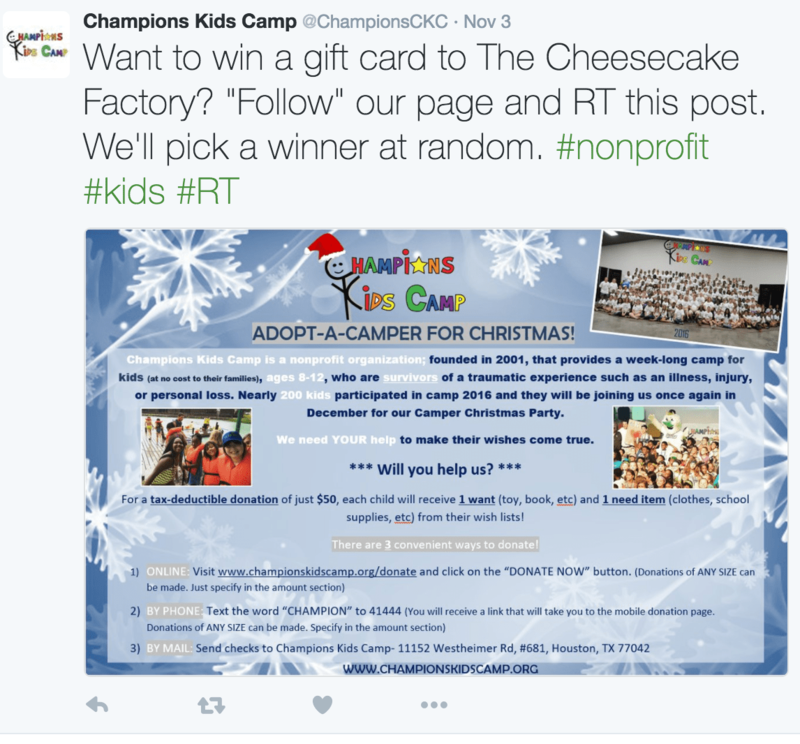 This is an excellent way to generate buzz on social media, reward your donors, and encourage giving. It’s also a win for the partnering business, as well as a way to foster local business partnerships. People love buying gifts during holidays. Give them an opportunity to buy meaningful gifts by turning your services into a gift catalog. Create somewhat of an online flyer, so your audience can “shop” and make donations. Promote the catalog via email and social media. This is a simple, yet effective Thanksgiving fundraising idea, but you can also use it during other holidays (especially Christmas). American Red Cross created an online catalog to showcase their services. Everything from hot meals to hospital kits and vaccinations is available to purchase. #GivingTuesday falls on first Tuesday after Thanksgiving (November 28th this year). In order to make the best out of this viral campaign, make sure you prepare a landing page on your website in early fall, so that it’s ready to go live on Thanksgiving or #GivingTuesday. A branded donation page generates a 36% larger donation size compared to a generic landing page. Impactful: Donor’s gift contributes to something meaningful. If you can, secure gift matching for the holiday season. Specific and exclusive: “Thanksgiving 2017” stands out compared to the generic donation button. Limited-time: Donor’s contribution counts towards the final number only if they donate now. Begin sending emails to your donor list before #GivingTuesday. You need to be on their minds and in their hearts so that when the time comes to donate – they choose you and they don’t exhaust their philanthropic budgets with other organizations. Make sure the donation process runs smoothly both on web browsers and mobile devices. Any hiccup can give someone an excuse not to give. As the weather gets cold, people start dreaming of exotic tropical getaways (or winter wonderlands if they are snow lovers). Hold an end-of-year Thanksgiving holiday raffle. Advertise it and present donors with 3 or 4 options to keep it simple. You only pay for the winner’s choice. Organize a 5k, 10k, or a marathon run to fundraise this Thanksgiving. Design a campaign and incorporate crowdfunding and peer-to-peer fundraising methods into it. Let participants set up peer-to-peer fundraising pages to collect donations for racing and encourage them to share their pages across their social media accounts. They’ll simultaneously gather more donations and promote the race, increasing sign-ups. Encourage your runners to dress up and reward best costumes. You could also reward division winners (or anyone crossing the finish line) with cinnamon rolls! Depending on the size and the scope of your organization, you can either opt for a physical bake sale or a virtual bake sale. 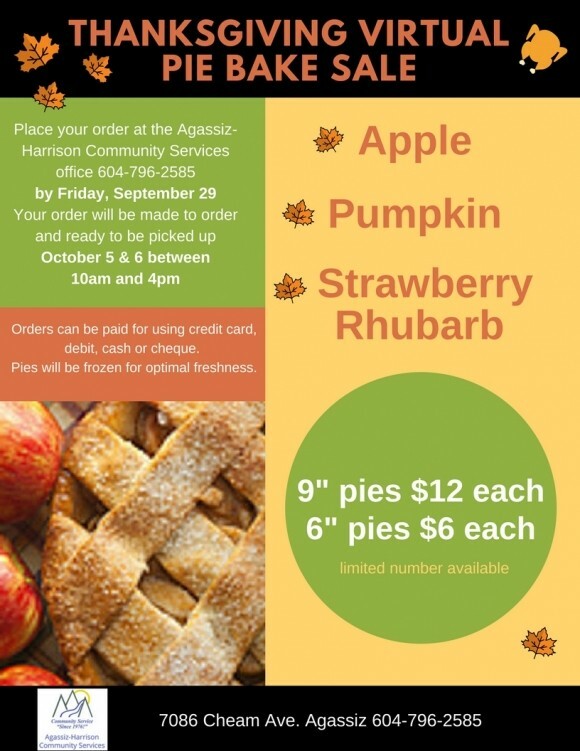 This Thanksgiving fundraising idea is a seasonal twist on a traditional fundraiser. Bake sales are go-to fundraising events for many schools and faith-based organizations like churches (read more church fundraising ideas here). To make the virtual bake sale seasonal and relevant, the baked goods should be fall-themed or Thanksgiving-themed. Think apple pies, crumbles, and anything pumpkin spice. Get on board several great bakers who can bake season favorites. Each baker selects the treat they will be baking for the sale and commits to specific numbers of those treats they can bake (e.g. 20 apple pies – if that many are sold). You promote the sale online, and your marketing directs people to a dedicated landing page. This page should contain goods for sale, their prices, images, and donating links. When donors make a selection, you send them out a confirmation email and inform the baker. The baker makes the selected goods, and you ship it out. You could also organize a pickup time if your donors are local. The colors of fall – red, orange, and yellow are provided free of charge by nature, which makes this idea a cost-effective Thanksgiving fundraising idea. Many people love going for day trips this time of the year to enjoy the scenery. Put up a ‘fall foliage’ or ‘fall colors’ trip and advertise it locally. This type of event is particularly popular amongst the elderly population, so make sure you advertise it to retirement homes and senior centers. Rent a bus and a driver (or have someone from your organization drive), plan a route (making sure the scenery is colorful and there is a spot for lunch on the way). Selling tickets for trips like these should be fairly easy, just make sure the tickets can cover the price of the gas. 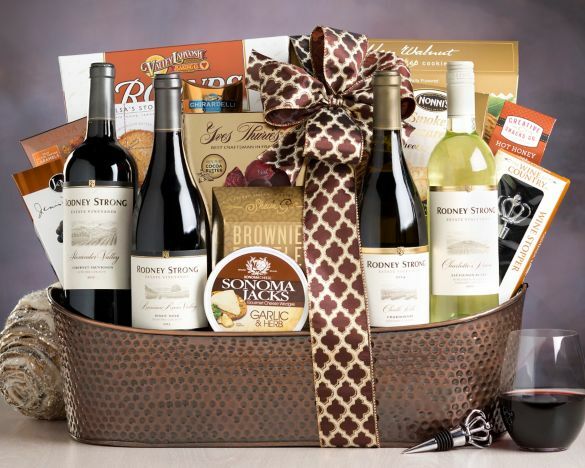 The holiday season is all about giving, and gift baskets are amongst the most frequently given gifts. Create your own gift baskets to sell, preferably designing several different ones to fit different buyer profiles and budgets (e.g. wine basket, artisanal baked items, or body care packages). 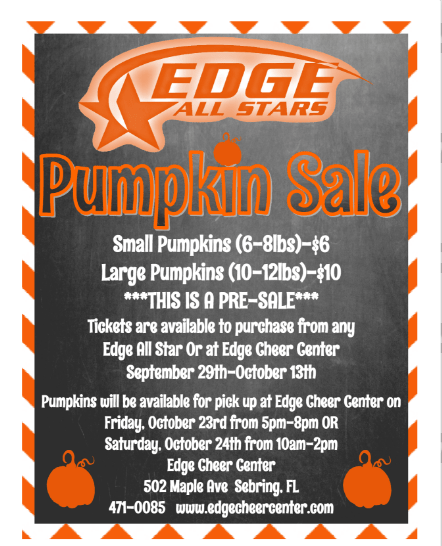 There is also the option of raffling off a few baskets with bigger ticket items. Perhaps one basket may have a $50 gift card and another an iPad. Nothing says fall time like pumpkins. That is why this fundraising idea is perfect for fall and Thanksgiving. Host a pumpkin sale to benefit your nonprofit by ordering pumpkins in bulk from a local farmer. Then sell those pumpkins at your offices or a public space (like farmer’s market) at a higher price to raise money. Read more about a wonderful partnership between a pumpkin grower and several nonprofits and churches here. Pumpkins are not there only to be sold. Try organizing a pumpkin carving or decorating contest. Supply pumpkins, pumpkin carving tools and accessories, and let the fun begin! Ask participants to pay a small fee to participate. 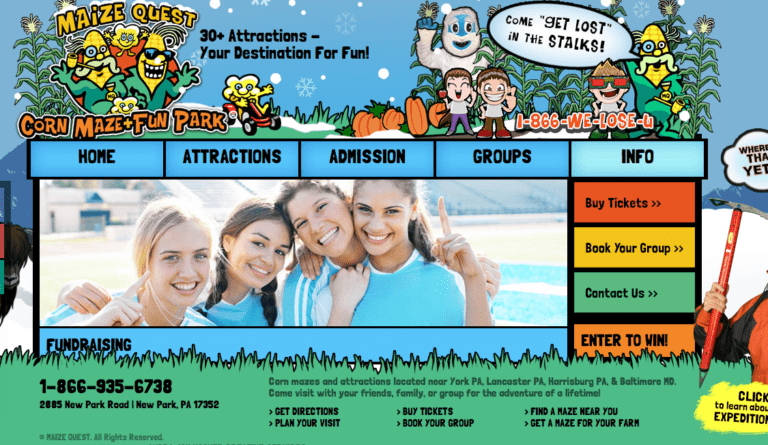 You can also combine the pumpkin carving contest with face painting, photo booths, board games, and petting zoos. Pumpkin carving is suitable for all ages, which makes this an amazing fundraising idea to try out! Make the most of the fall harvest and Thanksgiving season and arrange a Harvest Fest for your group, setting up sales of local produce that are particularly in demand around this time of year. Find and make contact with a local farmer who is willing to sell you a large quantity of seasonal produce (e.g. apples). Organize a fest selling apples, other produce, corn on the cob, apple cider, and other seasonal stars. If you really want to go all out, rent some bouncy castles, inflatable slides, and any other activities you can think of and your nonprofit can get your hands on. All that fall foliage makes for an amazing day trip, but many people spend a lot of time clearing leaves during the fall. Offer yard cleanups in exchange for donations. Mobilize your volunteers to do this. If you don’t have a volunteer base, consider partnering with a local school. Helpful supplies include extra large yard bags, rakes, yard gloves, and bag stands. Candles are a staple of home decor for fall/winter. They are also a great gift to others. A candle fundraiser, therefore, is an excellent way to raise some additional funds this Thanksgiving. 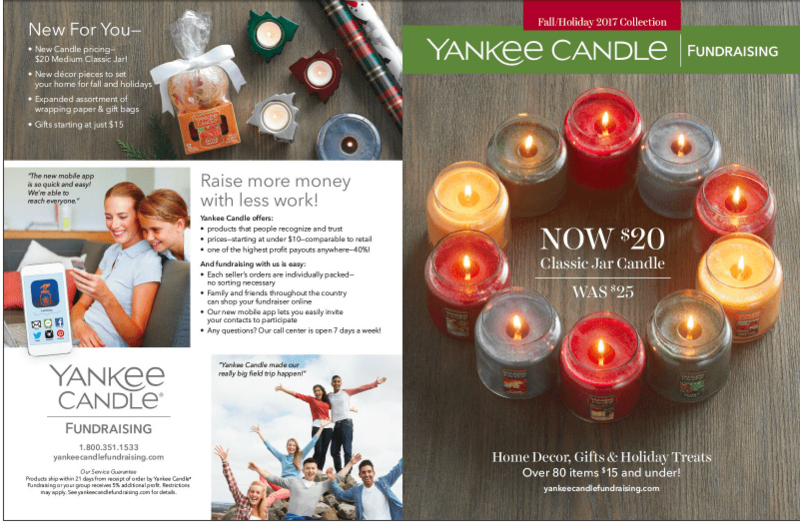 Yankee Candle partners with nonprofits on selling candles and sharing profit. People have over 150 items to choose from priced from $6.00 to $28.00. Choosing Yankee Candle Fundraising gives your supporters a product that they recognize, and you get to keep 40% of the profit, no material costs invested. There are two ways to go about this. Either you create your own maze/obstacle course in a large open space (like a parking lot or an open field), or you can partner with a local farm that has an existing corn or hay bale maze. Organize a family-friendly event where all proceedings would go to your organization. The end of the year is around the corner—the single biggest fundraising opportunity of the year! From Thanksgiving onwards generosity skyrockets, causing people to be more generous with their time and money to help support causes they care about. Segment the donors based on their communication preferences and how they prefer to give. Campaign and use email marketing. Think outside the box and try some of the ideas above that you haven’t tried before. This time of the year is crucial for nonprofits. Set yourself off to a good end of the year (and the beginning of the next one)! P.S. Don’t forget to be grateful for and to your donors.